A new perspective. . . . .
A few blogs ago my writing was full of angst as I talked about feeling like I was, figuratively, at the “end of my rope”. I wrote about a good friend’s advice that one should just “tie and knot and hang on” when finding oneself in that predicament. However, as I read from my favorite devotional Daily Strength for Daily Needs (compiled by Mary Tileston with original copyright 1997), I came across a sentence that changed my perspective. Let us fall into the hand of the Lord. Amen. Suddenly I could imagine letting go of that knot and drifting into the strong yet gentle hand of God as I fell. Is that not where we all need to be? Letting go of the need to control current events. Letting go of the worry about what might go wrong in the future. Letting go of the perceived need to be all things to all people. Letting go of the desire for the unattainable–perfection in this life. And, instead of holding on for dear life as that rope burns our hands and our sweaty palms begin to slip, just trusting that our Lord and Savior is there to catch us as we fall, and letting go. He is, after all, our Savior. Good morning. This is God. I will be handling all your problems today. I will not need your help. Have a nice day. I think I need to post it there again, to remind me that the rope of my life with all its difficulties and dilemmas and perceived disasters is poised right over God’s hand. 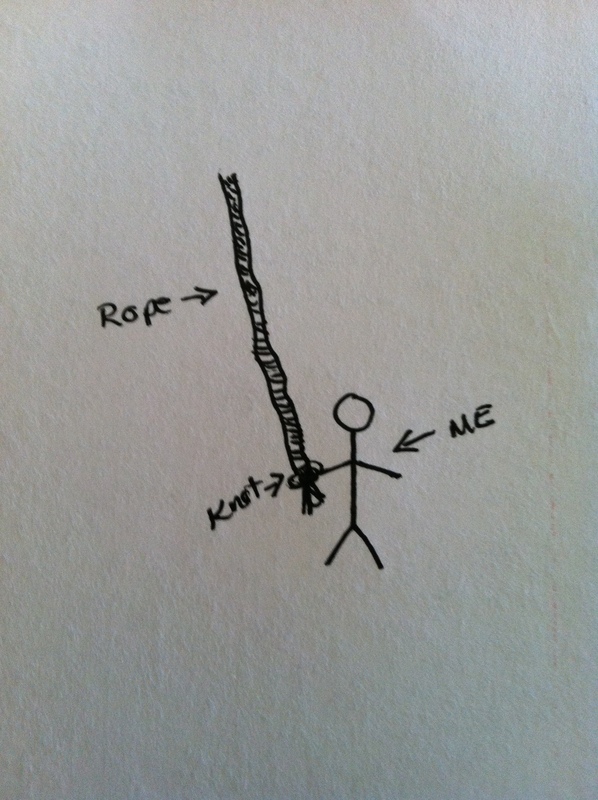 I may just need to let go of that knot and rest in God’s strong, gentle, loving, open hand. Thank you, Lord, for this reminder. I pray that it may speak to another’s heart. Amen. Previous postWhat’s in a flag? Next postWords of hope. . .